Left to right: Caroline Newcomb, Dr Arthur Barnes, Brian McFann, Steve Newcomb. 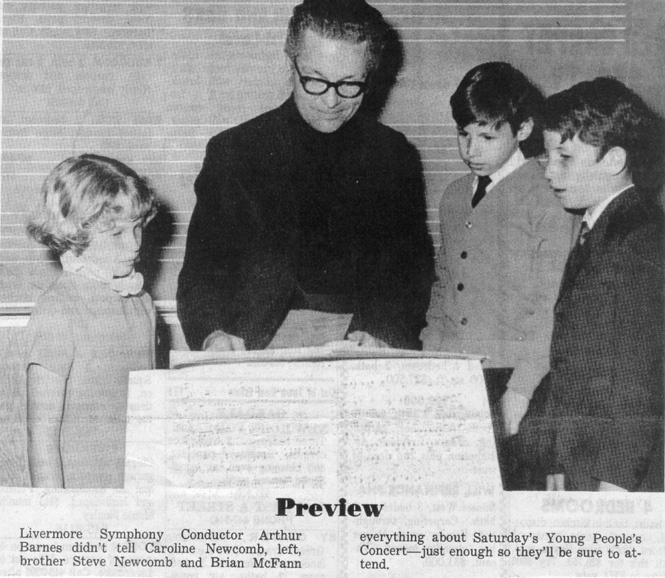 Note: For more information on the Livermore-Amador Symphony, visit their web page. If you would like to share a memory related to the picture, please write to the webmaster. The kids in the picture are members of the high school graduation classes of 1976 and 1977. To find other pictures of these classes in the archive, see Livermore class pictures listed by year of high school graduation. And if you have any pictures from this era that you would like to share, please submit them to the Archive. The kids in the picture were students at Joe Michell School. To find other pictures from Joe Michell School in the archive, see Livermore class pictures listed by school: Joe Michell School. And if you have any pictures from Joe Michell School that you would like to share, please submit them to the Archive.